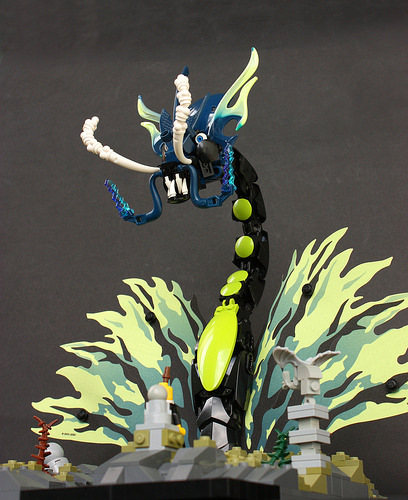 This dragon model by Eero Okkomen has made me question how a LEGO creation can have so much personality. It proves an image can tell a story without an accompanying explanation — you don’t need to be told, you just know to fear and respect the summoned serpent. I’ve always thought the Ninjago Morro Dragon set is a mine for amazing pieces, but I would have never in a thousand years have used the wings like this — awesome. And that face — so much expression with so few pieces. The smoke coming from the nostrils is just brilliant, and so are the electric moustaches. Overall, this model is an art piece, and I wouldn’t mind displaying it in my living room, like an ukiyo-e style sculpture.